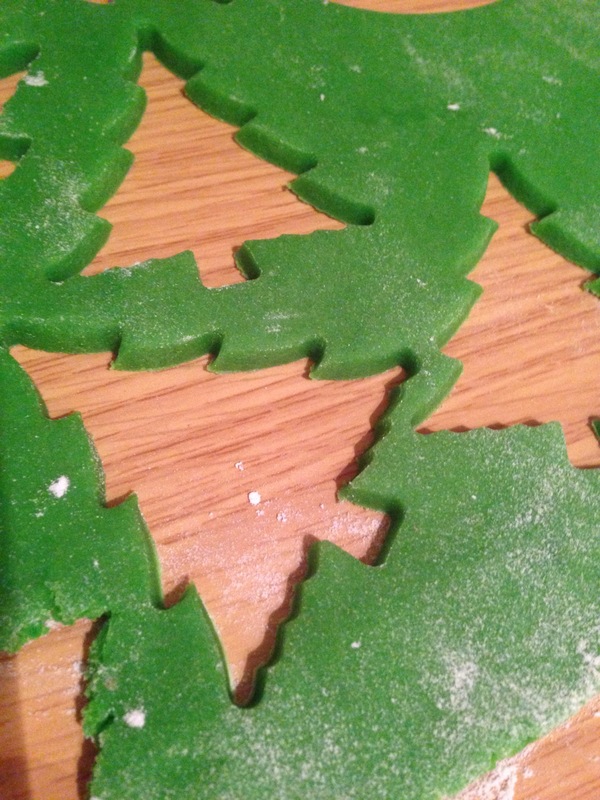 For these Christmas Tree Cookies, half of the cookie dough is easily coloured forest green by adding about a third of a teaspoon of green gel food colouring (it’s the same stuff I use to make my Rainbow Cake!). I often get mine from eBay for a couple of pounds, or you can try your local cake decorating shop.You can wear clean rubber gloves if you’re worried about your hand getting a bit green, and just gently knead the colouring into the dough. It will go tie-dye at first, but keep kneading until the colour is completely even and the dough is a forest green colour. I find that the easiest way to bake cookies is to line your baking trays with these non-stick baking liners, which I got from Lakeland. They were £10 and I cut the sheet to size, which was enough for my three biggest baking sheets. They make it SO easy to get cookies off the tray, and they also mean that your tray won’t be dirty so you (probably) won’t have to wash it! I also use them when I’m making decorations from melted chocolate or candy melts – again they peel off so easily when they’re cooled. PS I think that I invented this idea (maybe!). I’ve not seen anything else like it despite googling… let me know if you have! I love this idea so much! Can’t wait to try it. I was wOndering if the recipe can be doubled? Thank you so much Alice, same to you! Hoping to make these for the first time in a few days. Don’t have vanilla paste – are you able to recommend a suitable amount of vanilla (or almond) extract? Thank you so much. Hi Grace! They stick together because the cookies expand slightly when baked, but they don’t mix in any way. Have you looked at the pictures? How long do they keep for? If you hAng them on the christmas tree dOnt they go soggy? Hi Debbie, I don’t hang these on a tree – I just eat them! These look fantastic! It’s such a simple idea but looks really effective – definitely something I want to try. These are so fab, my kids would love them. A great activity in the run up to Christmas! My kiddoes would love to make these Kerry. 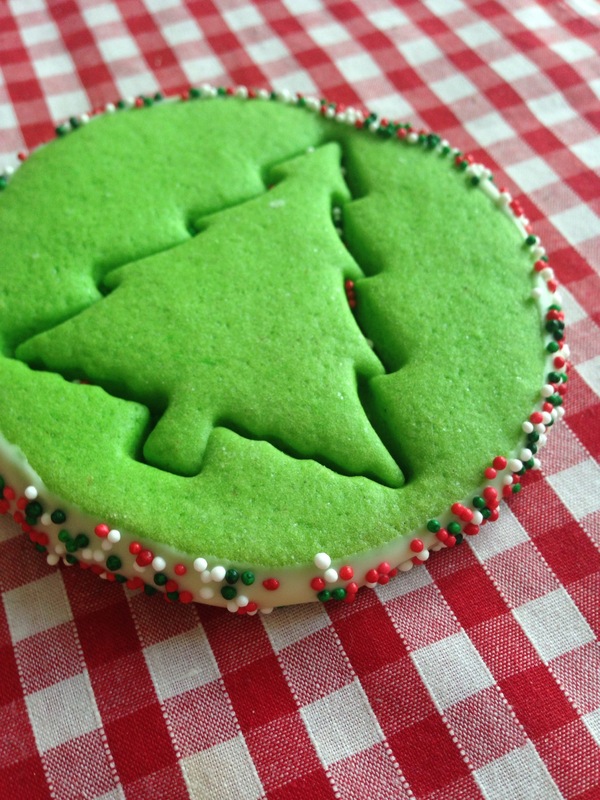 These are the most adorable Christmas cookies! Thanks so much Laura! I really think they are! These look great, I love the colours and the idea is so effective. My kids would love to do something like this for some fun Christmas baking! Thanks Lucy! I think it would be awesome with other things too like yellow stars, or blue snowflakes!